Abstract: Linux is free, relatively easy to install, but what about software? How do you add programs and software in an environment that isn't based on the familiar rules of the Microsoft Windows world? In the first two parts of our set of Beginner's Guides to the Linux operating system, we familiarized you with the popular KDE desktop environment via a 'live' CD Linux distribution and explored installing Linux permanently onto your system. As you've probably realized by now, modern Linux versions including SUSE 9.1, which we used in Part 2 of the guide, can perform almost all of the functions which we take for granted with Windows, making switching operating systems much less painful. But what if you need or want to install new programs in the future? Everyone knows how to install new software in Windows… Just double click the installation file and 'next, next, next,' etc. Linux is a little more complicated and installing programs is not near so immediately intuitive. In this third PCSTATS Beginner's Guide to the Linux operating system, we're going to explore an essential Linux skill; how to track down and add new software packages to your Linux installation. The most common format for software installation files in Linux is the package. Linux Packages are simply groups of the necessary files for installing and running that specific program bundled within a single file that can be executed by a package manager. 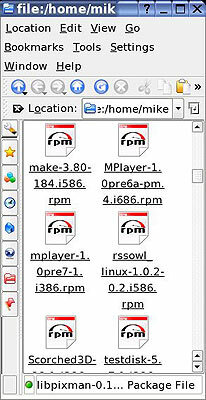 There are a few different package formats out there, but the most common are RPM (RPM Package Manager) files. These are used by most of the major Linux distributions including SUSE. Selecting and adding these packages to your Linux installation is where the incredible diversity of the Linux world may become more of a burden than a benefit. Since each Linux distribution is different, there's no telling whether your particular version has all the background files needed to allow a given package to install and run correctly. For this reason, it is best to use packages formatted especially for your version of Linux. Unfortunately, this is often impossible. With hundreds of Linux distributions available, no programmer could possibly tailor his or her software for each one. Since it is impossible to create a separate installation package for every available Linux distribution, most software manufacturers create a single RPM package for a single Linux distribution. Users who wish to install this package on other distributions must resolve any dependencies that package may have. Dependencies are a package's links to other software resources that must either already be present on the host computer or be installed previously from the same package in order for the program to work correctly. Due to the open source nature of Linux, individual files and applications (for example the KDE desktop manager that SUSE 9.1 uses) are constantly being changed and updated, often breaking compatibility with other applications in the process. In contrast, major Linux distributions like SUSE 9.1 itself are static, since each version of a distribution comes with a list of applications and program libraries that it always contains when first installed. Using this list, software developers can easily prepare their programs for that distribution by tailoring the packages to include any missing files that will be needed. If a user downloads a package for a different Linux distribution than the one he or she is currently using, it will still work, but that user may first have to track down other packages which install resources that the first package depends upon. This is where package management software comes in. Package management software analyzes each package the user wants to install and compares its list of dependencies to the software installed on your Linux system. It will inform the user if anything is missing, and name of the missing packages so that they can be downloaded and installed.